Two McCormick X7 Pro Drive tractors fresh from the factory – and the first to be seen in Britain – were available for farmers to inspect and drive at locations near Kendal, Millom, Great Eccleston and Skipton. 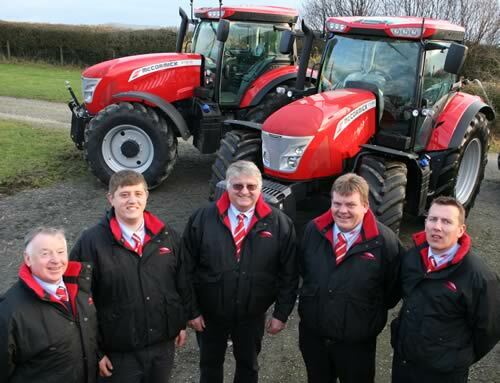 The sales team with the first McCormick X7 Pro Drive tractors seen in Britain (from left): Alan Robinson, Jonathan Hoggarth, Bryan Hoggarth, Murdo Macphee and Adam Graham, who also looks after the Hog Hire tractor hire fleet. “The development of these new tractors was a deciding factor in our recent switch to McCormick from the brand we represented for 20 years,” says Mr Hoggarth. “The current McCormick higher horsepower models are solid, simple tractors but a lot of owner drivers and operators want something with more technology and sophistication these days. Bryan Hoggarth and his team are determined to put McCormick back on the map in an area where the range has lacked dealer support in recent years. The territory allocated to the Carnforth-based dealership covers north Lancashire and south-east Cumbria, then eastwards into the Yorkshire Dales. Established McCormick dealers successfully cover adjoining areas. Farmers and contractors who went along to the daytime customer events certainly showed keen interest, with most getting behind the wheel of the six-cylinder X7.670 Pro Drive. Comments about the new cab and control console, as well as the tractor overall, were very encouraging. “I think everyone who came along now recognises that the new models stand comparison with similar tractors from other leading manufacturers,” says Bryan Hoggarth. “And the X7 Pro Drive is just the beginning – the McCormick range will be transformed by a whole series of new models over the next couple of years.